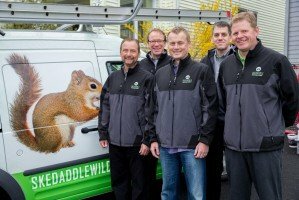 Skedaddle Humane Wildlife Control has been humanely removing and excluding wildlife from homes for over 24 years and we certainly understand the anxiety and frustration that wild neighbours can cause. In speaking with thousands of home and business owners we learned that education and understanding are critical to helping humans and animals exist together. Skedaddle Humane Wildlife Control specializes in the humane removal and exclusion of wildlife from your home or business. We have experienced, highly-trained technicians and customer service representatives ready to help you.